I'm a bit embarrassed to admit that I ate my first Brussels sprout a mere 5 years ago. I'm not entirely sure why these delightful vegetables get such a bad wrap, or why I unwittingly fell for it. 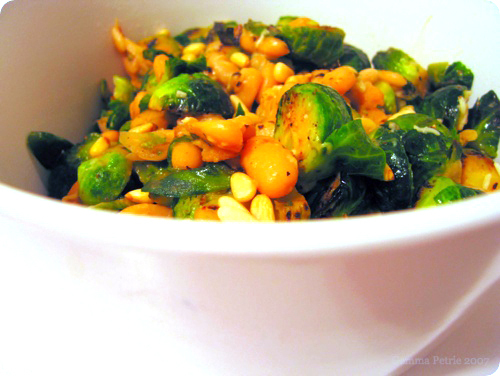 Though, I do know that Brussels sprouts have become one of my favorite fall vegetables. I've also recently become obsessed with the buttery, nutty cannellini bean. On many evenings over the past few months I have enjoyed the beans simply warmed in butter and seasoned with salt and pepper. I was pleased to find a recipe recently that combined both of these ingredients. Serves 8 as a side or 2 as a main dish. Heat 1 tablespoon of oil in a skillet over high heat. Add half of the Brussels Sprouts and cook until browned, about 5 minutes. Transfer to a large bowl and repeat with the second half. Heat the last tablespoon of oil over high heat. Add the garlic and stir constantly until brown (not black). Add the vegetable stock and Brussels sprouts, cook for 3 minutes. Add the beans and butter and cook until liquid is reduced, abut one more minute. Season with salt and pepper. Transfer to a large bowl and mix in bacon, Parmesan and pine nuts. Serve warm. While this would make a lovely side dish, it also makes a great meal for a chilly night. i've been eating brussles sprouts weekly ever since (canadian) thanksgiving. this recipe looks great! this looks so delicious. i have been on a black beans and rice kick but need to switch things around a bit. i'll definitely try this tonight. Hi Gemma! This is my first time commenting even though I've enjoyed your blog for a while. I also love Brussel sprout - I never let the reputation of brussel sprouts dissuade me, but I did have to deal with crooked glances from other children when i announced that I indeed enjoyed the most evil of vegetables. 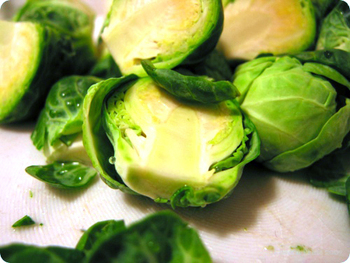 Brussels sprouts are a tough sell, so you're not alone in coming to them late. Myself, I am a huuuuge fan of white beans of any sort, especially cannellini, so this sounds quite good, Gemma. Gemma, those photos are gorgeous. Are they with your new camera? Brussel sprouts get a bad rap. Wholly undeserved. I'm a big fan of the white beans, I'll have to give this one a try. I love brussels sprouts too ... brilliant when steamed, halved, fried up with some bacon and tossed with a few toasted chestnuts! I was actually debating between this recipe and one for roasted sprouts last night. I went with roasted and they came out a little burnt. Yours look so much better.